We have collected and analyzed 41 expert reviews and 766 user reviews from international sources. Experts rate this product 87/100 and users rate it 94/100. The average review date is Jun 2, 2015. We have compared these reviews to 325731 reviews from other Desktops. The alaScore™ for this product is 95/100 = Excellent. Last update: Apr 23, 2019.
alaTest has collected and analyzed 21 user reviews of Apple iMac 27-inch Retina 5K, Late 2014 (MF886, Z0QX) from Amazon.co.uk. The average user rating for this product is 4.9/5, compared to an average user rating of 4.2/5 for other Desktops on Amazon.co.uk. Views about the reliability and size are on the whole positive. The usability and price also get good feedback. 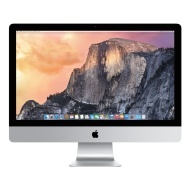 alaTest has collected and analyzed 77 user reviews of Apple iMac 27-inch Retina 5K, Late 2014 (MF886, Z0QX) from Amazon.com. The average user rating for this product is 4.4/5, compared to an average user rating of 4.0/5 for other Desktops on Amazon.com. Views about the reliability and usability are on the whole positive. The design and price also get good feedback. There are some less positive opinions about the size. Apple iMac with Retina 5K display begins shipping today with a 3.5 GHz quad-core Intel Core i5 with Turbo Boost speeds up to 3.9 GHz, AMD Radeon R9 M290X graphics and a 1TB Fusion Drive for a suggested retail price of $2,499.